It is easier said than done to save a considerable amount of money and build an emergency fund. It is easier said than done to save a considerable amount of money and build an emergency fund. The experts often suggest to save around six months of your living expense. But, it often becomes difficult to save money when struggling with monthly mortgage payments and other bills. However, it is not an impossible task. Here are 6 easy tips to stash money and build an emergency fund. 1. Do a ballpark estimate – To start saving, at first, you need to make a ballpark estimate of how much you can save in a month. To do so, take a paper and pen and calculate how much you need to spend every month. While calculating, take into account your car payments, mortgage payments, insurance payments along with the money you spend on food and utilities. 2. Star saving a little amount – It is quite difficult to save a lot of money at first. Therefore, start saving a little amount every month. For example, you can start by saving money worth of one month’s expense. Once you are successful in doing that that, try to increase the amount you save. Even if you are not able to save what you saved last month, don’t give up. Save as much as you can in that month but never lose the habit of saving. 3.Keep a watch on where your money is going – It will be much easier for you if you can keep a record of how much you’re spending each day in a week. What you can do is keep a note-book and pen, and write down the item and the amount whenever you’re giving dome dollars and cents, or swiping your debit or credit card for a purchase. Then, calculate the average amount you spend every day. This will help you cut down your expenses which might not be that much essential. 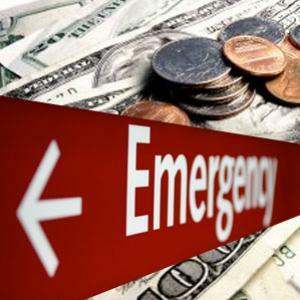 It will help you save a considerable amount, which you should put in your emergency fund. 4. Opt for automatic contributions – One of the best ways to stash money is to make automatic contributions to the savings account. By doing so, you won’t spend that money unless it’s a financial emergency. It is better if you opt for moving a smaller amount such as, $50 from each of your paycheck to your savings account. This way, you’ll save at least a certain amount in your savings account every month. 5.Continue making minimum payments on credit cards – It is always better to pay your credit cards in full. However, when you do not have an emergency fund, instead of paying your credit cards in full, you can make little more than minimum payments on credit cards; and, make contributions towards building an emergency fund. This will help you repay your credit cards as well as build an emergency fund so that you don’t have to tap your credit cards next time you need money. 6.Save any unexpected money you get – Try to think what you did with the money when you got it unexpectedly? You might have used the amount to buy an item. Next time, you get an unexpected tax refund, put the amount into your emergency fund. Another thing you can do is, when you get a pay raise, continue living as you did before your pay hike and deposit the entire extra amount to your emergency fund. When you are successful in building your expected emergency fund, treat yourself and start saving money for a purchase you wanted to do for a long time. Do not use your credit card for any purchase, save each month and once you accumulate enough funds, buy the item. After that, you can continue saving as you used to save in order to increase your savings in order to achieve your financial goal. Remember, once you use a part of your emergency fund, start saving every month till you are successful in saving the required amount in your emergency fund. This will help you live a free of debt.